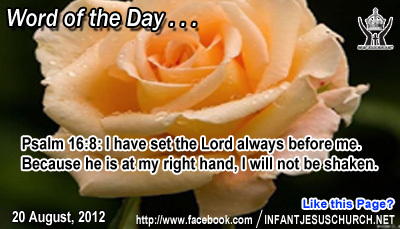 Psalm 16:8: I have set the Lord always before me. Because he is at my right hand, I will not be shaken. Heavenly Father, you are praiseworthy of majesty, honor, and praise. We lift up your name, O God, and set it above every name. As we look to the future, we want to honor you and we want to travel with you there. Since we believe you will never leave or forsake us, we will always look ahead to find you leading our way. Through Infant Jesus we pray. Amen. Treasure has a special link to the heart, the place of craving, desire and longing, the place of will and center. The thing we most set our heart on is our highest treasure. The Lord himself is the greatest treasure we can perhaps have. Giving up all else to have the Lord as our treasure is not sorrowful, but the utmost joy. See Jesus' parable about the treasure concealed in a field. Selling all that we have could mean many dissimilar things – our friends, our job, our method of life, what we act with our free time. Jesus confronted the young man because his heart was jealous. He was afraid to give to others for fear that he would lose what he had achieved. Those who are openhanded towards God and others find that they cannot outmatch God in kindness. God blesses us with countless spiritual goods – such as long-lasting peace, overwhelming joy, enduring love, abiding relationships and friendship that does not weaken or fail – that far outweigh the fleeting joys of material belongings which fail to satisfy us beyond the present moment. God alone can satisfy the sincere longing and desires of our heart. Are we willing to part with anything that might keep you from seeking everlasting joy with Jesus?